Lift. Tone. Burn. is the Pure Barre mantra. I’ve written many a post about Pure Barre whether it be about our new cardiocentric version of barre – Empower, 10 Tips for Your First Pure Barre Class, and Pure Barre Pregnancy Modifications. What I haven’t covered in depth yet is what to wear to barre class. 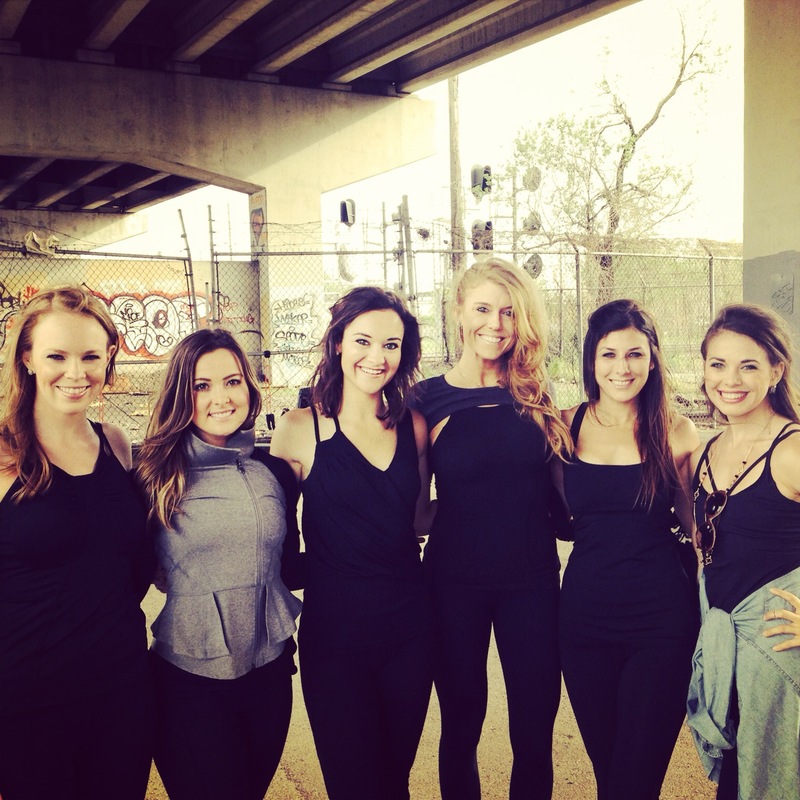 If you’re new around here, I’ve been teaching Pure Barre for 8 years now and still love it. I usually take 3 days a week and do cross training 2 other days during the week. As you may imagine, I have developed quite the love for athleisure clothes. 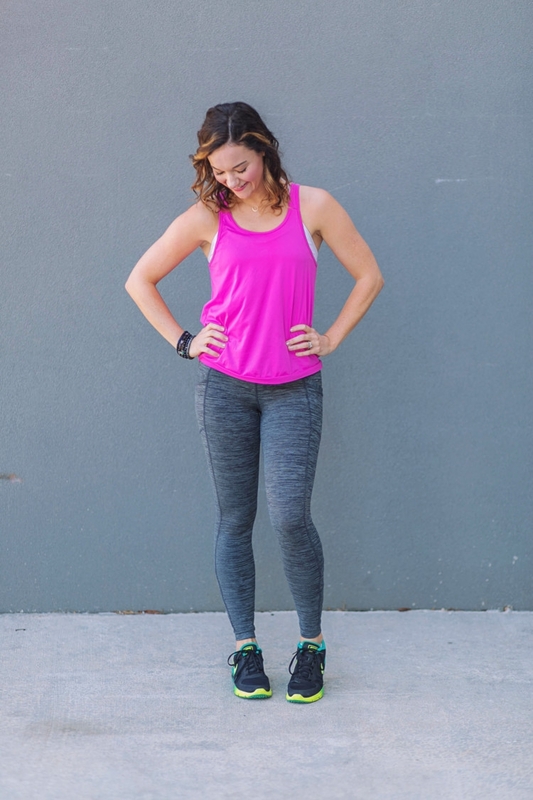 You can see some of my favorite fitness brands broken down in this post. A lot of you have mentioned trying out Pure Barre for the first time or coming back to barre after taking a fitness hiatus during the holidays so I’m here to be your what to wear to barre class guru. Ha! Is that even a thing? Well, we’ll make it one. Ponytail holders are of course a necessity. Some women come to regular Pure Barre with their hair down, and more power to them but I’m annoyed by pushups in our warmup that my hair is now flopping in my eyes. I’d highly recommend at least some bobby pins to pull your hair back out of your eyes and if you take Empower or cardio barre, you’ll definitely want a hair tie. Teleties are really popular in our studio currently because they help avoid hair creases and stay more sanitary than cotton ones that soak up your sweat. I just got some and have really liked them since usually I do get a crease no matter what ponytail holder I use but not with this one! Invisibobbles are a good dupe for a lower price point as well! Low to Medium Impact Sports Bra. I get asked about sports bras a decent amount which cracks me up because hello, flat chested club over here. 😉 Note that if you are doing a cardio barre or pure barre empower class that you should wear a higher impact sports bra if you are more gifted up top. 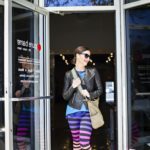 Barre is a great place to wear your fun, strappy and colorful sports bras to peek out in the back of your cut out tanks as mentioned earlier. Capris or Pants but NO shorts. We wear tight fitting pants or capris to keep muscles warm and help you get the most out of your workout. Shorts just aren’t feasible in a barre class setting. There’s mirrors everywhere and you end up doing positions that could possibly make you and your neighbor feel uncomfortable if you are in shorts that could expose…a bit too much. Wear the pants or capris that make you feel most confident, and then start to play around with cut outs, mesh panels and bright colors. Some of the pants I get the most compliments on are these crazy and fun K Deer Leggings pictured below. While I was looking at workout leggings, I was excited to find these moto and mesh leggings on sale 40% off at Nordstrom! Sticky Socks. We don’t wear shoes in barre classes, so you’ll want to wear a pair of sticky socks for the best experience. You’ll be lifting and lowering your heels a lot and holding in difficult positions on your tip toes so having that grip is KEY to not slip sliding all over the room. Most studios sell them at the front retail area, but you can also pick some up ahead of time, typically for a better cost. I’ve only ever worn the Pure Barre brand socks but some of our clients swear by the Zella sticky socks that Nordstrom sells. Water Bottle. Last but not least don’t forget your water bottle! It will be one of your best accessories, because not only will you use it for your barre class but you can keep it with you all day to get enough water. I love to use a water bottle with a straw or a large Yeti to help me get in enough water for the day. I’m dying to take one of these classes. I’ve heard they are amazing. I have metatarsalgia and my orthopedist has cautioned me not to go barefoot. I’d love to try barre, but can I do it wearing athletic shoes? Talk to your studio to confirm but we absolutely allow people to wear clean shoes each time if needed for a medical reason.